One would think that by backtesting more ideas and more frequently, the chances of discovering an edge increase. However, the opposite exactly happens: the chances of discovering something of value diminish with frequent backtesting. If you believe this is counter-intuitive you could try to think about it in a different way: If the frequency of backtesting made a difference in discovering an edge, then all those traders who struggle with machine learning algorithms would instead be rich. So what is the process that turns frequent backtesting into an exercise in futility? 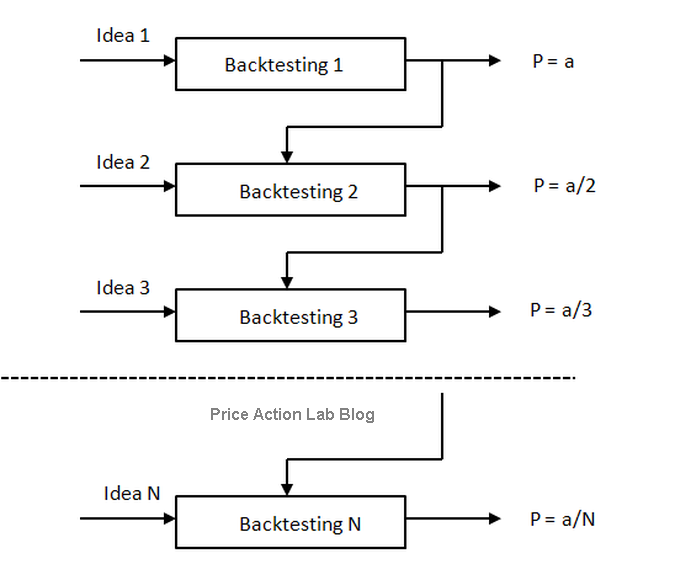 The conclusion is that traders should use backtesting only when there is a good idea to test. Actually, the idea must be as unique as possible. Then, the objective should be to try to debunk it, not prove that it is good by adding more filters and conditions. One of the fundamental problems of users of backtesting is that they try to prove that an idea is good when they should be trying exactly the opposite. The reason for this, which is also a counter-intuitive notion, is that there are very few edges and the probability that any one idea you backtest is a fluke is close to 1 to start with. These and other facts about backtesting that are rarely or never discussed, along with specific rules and examples of how to deal with data-mining bias, can be found in my new book. Mike, this is another great post. The paper from Bailey proves the same point but your post is much easier to understand. One way to test an idea is to see whether you could lose money on purpose. That is if you flip the signals, is your strategy performing poorly in a consistent way? Surprisingly more often than not it is really not easy to lose money deliberately. it's one think to write a paper and another to have gone through this for the last 25 years. While I agree with the underlying premise of the post, I think may be missing a trick with the positive side of back testing. If you’re not a long term trader of a particular market or style of trading, then frequent tests will create a feel for the market that you’re working on. This process of emersion allows for a fuller understanding of market dynamics and a richer appreciation of how a particular trading style may or may not be suited for the market under back test review. What you say is probably true and maybe another counter-intuitive fact about backtesting in the sense that in the process of trying to discover systematic strats one may become a better discretionary trader. I think this is true but it also depends on the effort put to understand the results of frequent testing.